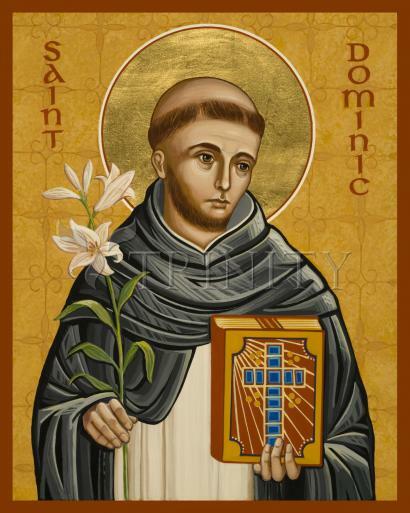 Dominic, founder of the great order of preaching friars which bears his name, was born in the year 1170 at Calaruega, Castile, Spain, of a noble family with illustrious connections. His father, Don Felix de Guzman, held the post of royal warden of the village; his mother, a woman of unusual sanctity, was to become Blessed Joan of Aza. Very early it was decided that Dominic should have a career in the Church. His call was so evident that while he was still a student, Martin de Bazan, bishop of Osma, appointed him canon of the cathedral, and the stipend he received helped him to continue his studies. Dominic's love of learning and his charity are both exemplified in a story of his student days. He had gathered a collection of religious books inscribed on parchment; these he greatly treasured, but one day he sold the whole lot that he might give the money thus obtained to some poor people. "I could not bear to prize dead skins," he said, "when living skins were starving and in need." At the age of twenty-five he was ordained and took up his duties. The chapter lived under the rule of St. Augustine, and the strict observance gave the young priest the discipline that he was to practice and teach to others all his life. Someone who knew Dominic at this time wrote that he was first of all the monks in holiness frequenting the church day and night, and scarcely venturing beyond the walls of the cloister. He was soon made subprior, and when the prior, Diego d'Azevado, became bishop of Osma. about 1201, Dominic succeeded to his office. He had then been leading the contemplative life for six or seven years.